This is an entry from the Profound Masters book. I decided to put it on the blog because I realized this is important should encounters with Supreme Judge Yu arise in a campaign (he goes after anyone who travels between realms without permission). It is somewhat incomplete as I am still working on the Profound Masters book, but should be enough for most GMs to make use of. As I mentioned in a previous blog entry, I am contemplating releasing some of our books on the blog itself. I have yet to make a final decision on whether Profound Masters will be released as a full book or as a series of blog posts (I should know by the time the Lady 87 book goes to layout). The last entry is the realm's most ferocious prisoners, Plum Tree Monk. Supreme Judge Yu is described fully in WANDERING HEROES OF OGRE GATE (pages 380-82). Lunar Realm is the moon of Qi Xien and home to Supreme Judge Yu and his wife Xing. Though it seems lifeless from a distance, up close it has many unusual features, including lakes and a small forest. 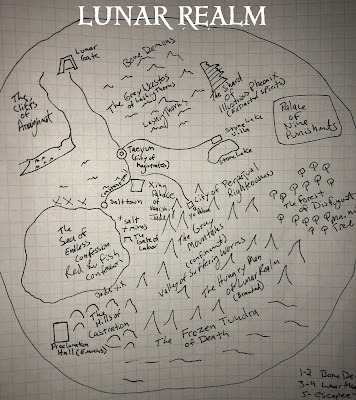 Lunar Realm is a place of law and the hub of the Bureaucracy of Heaven’s legal system. Its primary purpose is to punish those who transgress the boundaries of the realms, but any celestial being or spirit who commits a grave offence could end up in its courts. Even humans are subject to its punishments when they travel beyond the Realm of Man. Many of the punishments found here mirror or are similar to those found in the afterlife itself. For the most part, Lunar Realm is quite bleak, being filled with broken lands, mountains and frozen tundra. There are occasional oasis and glimpses of beauty, but it is something of a torment for Supreme Judge Yu that the place is so sterile. It wasn’t always this way. It was once vibrant, but that came to an end when Supreme Judge Yu and Xing met for the first time and waged a great war against each other here. The main site of the battle was the Grey Wastes, but the entire place was affected. The end result was desolation and marriage between the couple (also their followers were all killed and turned into Bone Demons). However, as a wedding gift to the couple, the Enlightened Goddess promised to restore the land if Supreme Judge Yu could solve a stone puzzle of her devising (this is located at Stone Lake). Roll Survival for Relevant Terrain every hour TN 6. On a failure roll on the following chart. If you get the result “Named Creature” this just indicates the creatures noted on the map are the encounter. 5 Escapee (any random celestial, spirit, demon, etc). *There is a 1% chance that this is either Supreme Judge Yu or his wife Xing. 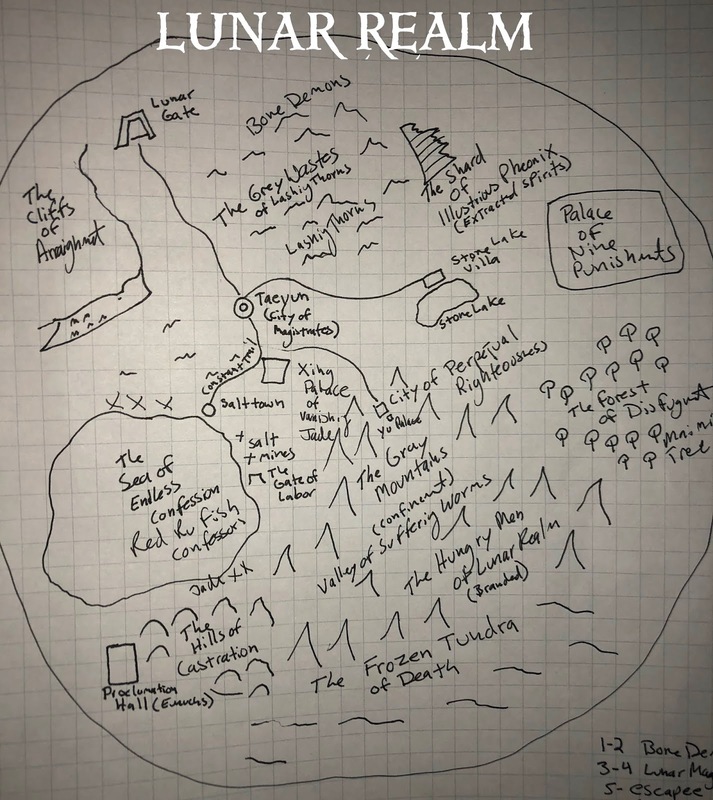 This is a quick overview of key areas in Lunar Realm. City of Perpetual Righteousness: This is where Supreme Judge Yu’s palace is located. It is a mountain city occupying a corridor pass (so there is one central road with many steps leading through the city). Though a place of righteousness and law, Supreme Judge Yu enjoys both food and music. There is always ample entertainment here and plenty to do. The city is patrolled by Judge Yu’s Bone Demons and Celestial Rocs. The Cliffs of Arraignment: This is a massive structure for holding anyone awaiting trial. It is a huge cliff-wall lined with individual cells, all heavily warded. The most feared prisoner of all is the Plum Tree Monk (see entry below). It is also guarded by Celestial Rocs. Constant Trail: This road is filled with laborers carrying Jade and Salt. Most of the Jade goes to Xing Palace for repairs, while much of the salt goes to Taeyun. The Forest of Disfigurement: This seems like a normal forest at first, but in reality the trees here have blades for leaves and spikes for conifer needles. This is the domain of Maiming Trees, who disfigure and maim anyone who passes by. Criminals sentenced to disfigurement or maiming are sent here. People sentenced to castration are sentenced here as well. See Maiming Trees below. The Frozen Tundra of Death: This is a horrible landscape of cold broken earth. Anyone who walks here must make an Endurance Roll TN 8 every five minutes or freeze completely. The result is death, but a special kind of death that holds the soul in abeyance and doesn’t allow it to reincarnate for a number of centuries determined by the courts. People sentences to death are marched here. The cold here will kill anything. Even celestial beings cannot withstand it (including Supreme Judge Yu). Only Bone Demons seem immune to its effects. The Grey Wastes of Lashing Thorns: The land here is dry, filled with deep canyons and ravines. It used to be a lush forest but there was a battle between Supreme Judge Yu and Xing here at their first meeting which resulted in the annihilation of both their followers at the time and their eventual marriage. If one looks closely at the landscape, there is a love poem carved by the couple at each major stage of the battle. The followers who died here became Bone Demons who are eternally loyal to the couple. These pose a significant threat to anyone passing through. Also there are Lashing Thorns here, which the only visible sign of life. These long ropey strands lash out at anyone nearby and rip the flesh. Hills of Castration: Despite the name, these hills are actually pleasant and safe. In fact this is one of the few safe areas to travel in Lunar Realm. They are called the Hills of Castration because only castrated men can travel through here and reach the end. Anyone else walks endlessly but never reaches the other side where Proclamation Hall resides. The one exception is Supreme Judge Yu. He can pass here freely. Still there is nothing of danger in the hills for anyone who gets lost here. The Hungry Men of Lunar Realm: As a special form of punishment, Supreme Judge Yu occasionally issues a facial brand of hunger upon beings guilty of minor but still exceptional crimes. Anyone with the brand is afflicted with a powerful hunger that can never be satisfied. The Hungry Men of Lunar Realm are made up of many different kinds of creatures (humans, demons, celestial beings, etc) but they all share a hunger and this results in them seeking to devour the flesh of anyone who enters the region and doesn’t have a brand (for some reason they do not desire the flesh of anyone wearing a facial brand of hunger). Occasionally, instead of sentencing people to death in the Frozen Tundra, when Supreme Judge Yu feels merciful, he sentences them to death here, where the Hungry Men eat their flesh. Proclamation Hall: This is a wooden palace with many gardens and fine pools. It is the seat of the Proclamation Bureau, an organization that manages Supreme Judge Yu’s edicts, manages the records of all cases conducts in Taeyun (they have an outpost in that city), and basically does all the printing for Lunar Realm. Any text that is bound, comes from Proclamation Hall. All ministers of the Proclamation Bureau are eunuchs. It is headed by Grandmaster Wu Da, an official with perfect memory who is said to know the details of every case in Lunar Realm by heart. Shard of the Illustrious Phoenix: This massive structure is a huge jutting, colorful crystal that rises from the ground and looms over all at five hundred feet high. It is filled with a confusing radiance that moves and reacts as people approach. This radiance is a collective made from the phoenix spirits that the shard has absorbed. The shard serves two basic functions: the primary purpose is as a vessel to house the phoenix spirits of criminals. When the ancient phoenix extraction punishment is invoked, this is where the person’s phoenix spirit is placed. Additionally, the shard is a source of wisdom, as the phoenix spirits retain many memories of their life experiences. Collectively they are known as Illustrious Phoenix, a being of exemplary wisdom and knowledge. Illustrious Phoenix will communicate with anyone who approaches but only answers important questions when Supreme Judge Yu’s talisman is presented. The Sea of Endless Confession: This very salty sea is rimmed with salt and jade deposits. However the jade is extremely ephemeral, lasting only 1d10 months after they are extracted (at which point it disappears in a trail of mist). It is still highly prized by Xing because its beauty is unique in the world. People are often sent here to perform labor as punishment. In such cases they work the mines. The salt and jade must be hauled to Xing Palace, where labor-sentenced criminals watch the fruit of their previous efforts evaporate as they replace vanishing jade with new material. Some are also sent here to extract a confession for trial. When this is the case, they are usually placed in a small boat that floats out to the center of the sea. There a Red Ru-Fish (WHOG, page 379) confessor is assigned to the person, with the aim of driving them crazy until they speak. The Ru-Fish is often assisted by a magistrate or two if torture is required. While there are no dangerous monsters or creatures in the waters, the Red Ru-Fish confessors enjoy leading people to believe they are in danger from such things as it enhances their interrogations. Stone Lake and Stone Lake Villa: This is where Supreme Judge Yu and Xing go when they need time to enjoy themselves. Stone Lake is perfectly clear lake, at the bottom of which is a curious stone garden arranged by Supreme Judge Yu himself. There are eight stones (6 round ones and two square ones). There is a gridline pattern made up of 9 rows. It is actually a puzzle created by the Enlightened Goddess to keep Judge Yu occupied. She has promised that the land will transform to a more lush and beautiful environment if he moves the stones into their proper place. Supreme Judge Yu is always moving the stones into different positions hoping to solve the puzzle. In truth, the stones are the riddle. Inside each stone is encased a celestial tool (largely farming implements and a special cauldron) that can be used to restore Lunar Realm. Taeyun (City of Magistrates): This is a thriving metropolis in the heart of lunar kingdom. It looks much like any other city. It is governed by subordinate magistrates of Supreme Judge Yu, who oversee the courts. This is where Lunar Realm conducts its trials. Valley of Suffering Worms: This is where anyone sentences to confinement is placed. They are wrapped in silken tubes and buried in the ground for the length of their sentence. Occasionally they burst from the ground as Silk Moth Demons (found HERE). Xing Palace of Vanishing Jade: This is a splendid palace of Jade, where Xing resides. Every inch of the palace is made from Jade taken from the Sea of Endless Confession. However the Jade fades only after 1d10 months, requiring a constant and fresh supply of new jade to be brought to the Palace. As a result there is a constant trail of laborers repairing the palace. Yu Palace: This is a palace made of Iron, Stone and Gold. It is where Supreme Judge Yu resides and forms a seal over a great underground prison for the truly dangerous celestial prisoners of Lunar Realm. The Plum Tree Monk is insane. He believes he was once a celestial official and the leader of Plum Tree Temple, which was in charge of managing the Enlightened Goddess’ plum orchard. The plums could only be handled by those who had purified their minds and embraced the teachings of Hen-Shi (for the Plum Orchard was under her care). He despised every minute of it and plotted for centuries to escape. He fled to the base of Mount Dao and masqueraded as the abbot of a temple (attracting disciples who he imbued with powers). Supreme Judge Yu tracked him down and imprisoned him. For Plum Tree Monk this was a great humiliation and he wants revenge against Hen-Shi. He is hoping to obtain the Life Keeping Stone so he can absorb its powers. Plum Tree Monk's Real Identity: The truth is much darker. The Plum Tree Monk was once the Red General who fell in love with Empress Sunan (The Dutiful Goddess) and guarded over her in Meidu after his death. Recently the Dutiful Goddess was betrayed by one of her servants who carved out her heart and brought it to earth to make use of its powers. The Red General found her body was driven mad by the sight. He went crazy and launched and attack against the Enlightened Goddess. This is the reason for his imprisonment by Judge Yu. The reason for his desire to obtain the Life Keeping Stone is it is the heart of the Dutiful Empress. Plum Tree Monk knows all Waijia and Neigong. Purple Hand of Death: The Plum Tree Monk can hit with a purple stream of energy on an Arm Strike Roll against Parry (up to 15 feet away) and each round he succeeds the target is stuck, losing 7 wounds that restore the Plum Tree Monks health. This does not work on anyone of higher Qi level. Purple Breath: The Plum Tree Monk can unleash a plume of purple mist in all directions that burns the eyes and blinds those affected for 2 rounds. This is a free action. The Endless Claw of the Plum Tree Monk: The Plum Tree Monk’s nail strikes like a sword blade and continues to scrawl wounds upon the body for days. Make an Arm Strike roll against Parry. On a success, the target is hit for 7d10 Open Damage, and takes 5d10 Open Damage every day for 10 days thereafter. Supreme Rebuttal: Any attack the Plum Tree Monk can wave his hand and send back the weapon at the target (for its normal damage). Make an Arm Strike Roll against attack roll. On a success the weapon is hurled toward the target (whether it be arrow, hand or sword). Change Shape: Can assume the form of a loris monkey. Bone Demons are fully described in OGRE GATE INN AND THE STRANGE LAND OF LI FAN (page 186). But their stats and abilities are repeated here so you don't need that material to use them. Waste Away: Bone Demons are on the brink of death and must consume virtuous flesh to survive. A normal person can extend their life by a month, a virtuous person can extend their life by 200 years. Without eating the flesh and extending their life in this way, they must make a Meditation Roll TN 7 every week or die. Illusions: A Bone Demon can weave a very convincing illusion to make it appear like a normal human. This can be any type of human it wishes (old, young, beautiful, ugly, tall, short, etc). However the illusionary transformation inflicts a single wound on the Bone Demon. It lasts for as long as the Bone Demon wishes or until someone magically forces it to end. This illusion cannot be detected by normal means. Only the most powerful magic can see through it. These giant talking birds look like normal Rocs except their plumage is more brilliant (with red, gold and blue being common). They eat flesh as well, but are only nourished by meat of the unrighteous (anyone with a negative Karma rating). Celestial Rocs are inhabitants of Lunar Realm where they guard the Cliffs of Arraignment and patrol the region for escapees. 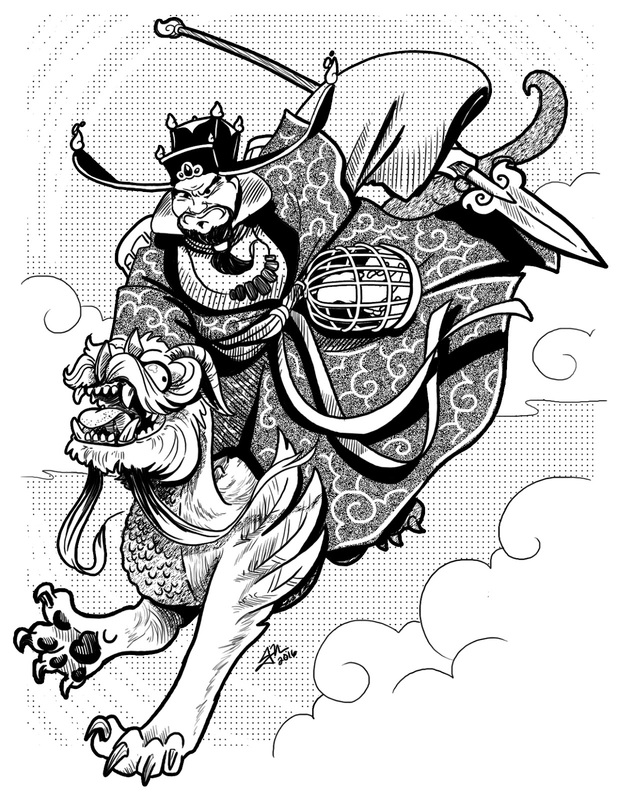 Celestial Rocs are trained in the classics and other scholarly pursuits as part of their upbringing in Lunar Realm. Bite: The powerful beak of a Celestial Roc does 10d10 Open Damage on a successful Attack. Total Successes on Damage rolls each do 2 Extra Wounds rather than 1. Their bite can overcome any immunity. Claws: A Celestial Roc’s claws do 6d10 Open Damage on a successful Attack. In addition, they can choose to restrain their target when they succeed in such an attack. 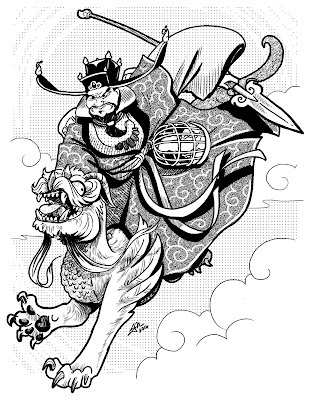 Immunities: Celestial Rocs are immune to Mundane attacks and can only be harmed by Kung Fu Techniques, magic or Jade Weapons. Sense Evil: On a Successful Empathy roll, Celestial Roc’s can determine the Karma rating of an individual. Scholarly: Celestial Rocs have a smattering of scholarly knowledge (a requirement of their training by decree of Supreme Judge Yu). The degree of mastery can vary from one Celestial Roc to the next, and some take interest in surprising areas of specialization, but the skills provided in this statblock offer a general guideline in this respect. These long vines grow in clusters in the Grey Wastes. They have sharp thorns and feed on the blood and Qi energy of their victims. Lash: On a successful Strike Lashing Thorns do 3d10 plus 3 Extra wounds. Each cluster can make up to four attacks and at a range of 50 feet. These look like normal deciduous trees and evergreen trees But on close inspection their leaves, in the case of deciduous trees, or their needles, in the case of conifers, form sharp blades or spikes. The trees lash out and maim anyone who passes near them. Lashing Leaves/Spikes: The leaves of Maiming Trees can attack like swords (leaves) or as ranged spikes (in the case of conifers). Both have the same attack roll, leaves can hit anyone within 10 feet and are made against Parry. On a success they do 4d10 Open Damage. On a Total Success they maim the target (taking a limb). Conifer needles can strike at a range of 60 feet and are made against evade. They do 2d10 Open Damage on a success, and disfigure the person’s face and body on a Total Success.